Designed and built right here in the USA, the AMP Research PowerStep Xtreme is the perfect solution for your lifted truck. Gone are the days when you or your passenger struggle to climb into your truck. The PowerStep Xtreme is designed for the harshest conditions featuring dual motors and a more aggressive design for extreme traction. for maximum assistance. Once installed, the PowerStep Xtreme hides out of sight until you need it. When a door opens, the Power Step Xtreme automatically extends( takes about 1 second to deploy), giving a rock-solid (600 lb weight capacity), safe and convenient step up into your truck that not only works hard, but looks great doing it. 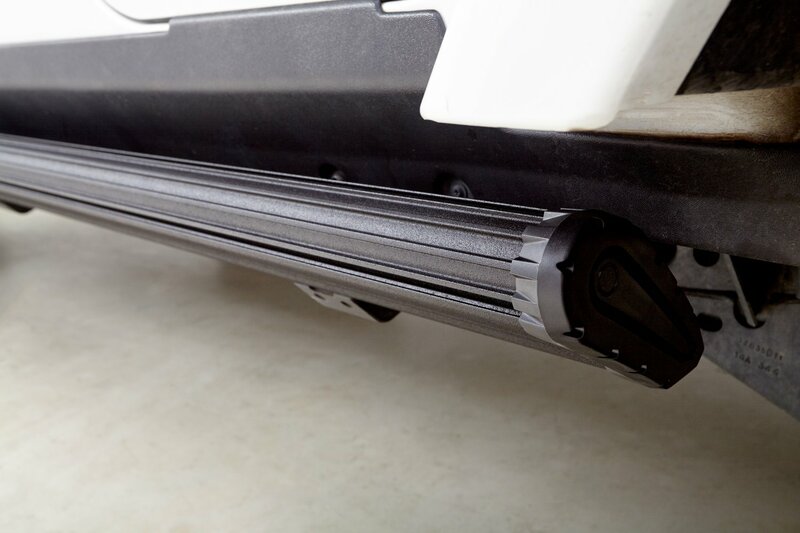 As soon as you close the door, the PowerStep Xtreme automatically retracts just as quickly and smoothly, streamlining the vehicle profile with no loss of ground clearance. Sounds great, right? It gets even better. When the PowerStep Xtreme deploys its integrated LED Lights illuminate, allowing you to see where you are stepping. The lights automatically deactivate as soon as the step retracts. The AMP Research PowerStep Xtreme has been extensively tested and proven to perform in severe driving conditions and is backed by a 5 year warranty. Its High strength, die-cast aluminum-alloy linkage arms, as well as its anodized and Teflon coated surfaces resist corrosion and are built to last. Installation of this item takes an average of three hours. Step by step instructions are included, however if you aren't comfortable Installing your AMP Research Xtreme Power Steps yourself, any truck customizing shop should be able to complete the installation for you. The part number for this item is AMP Research 78133-01A and it fits 2018 Jeep Wrangler JL (4 Door) models.